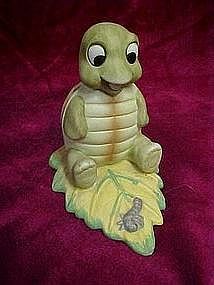 Another adorable turtle figurine from Homco. This Turtle sits upright on a leaf and curiously watches a caterpillar or centipede. Does he want to be friends? Or, just have him for lunch? Measures 4" tall and is made of hand painted bisque porcelain. Pristine condition.